Grapes are grown all over the world and aside from being used for wine production, they are a popular between-meal snack for us humans. They are actually a kind of berry and come in many colors, including green, red, black, yellow, pink, and purple. 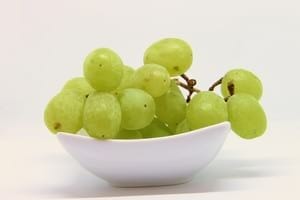 Grapes taste sweet as they are packed with natural sugar. And because of this, most bunnies will love to eat them. However, as with other fruit, it is important to consider grapes as occasional treats that complete a healthy rabbit diet. Before offering the grapes, rinse them thoroughly with running water as many grape vineyards will rely on pesticides to keep their grapes safe from bugs. Then simply remove the grapes from the cluster and feed them as a whole. If you haven’t offered your rabbit grapes so far then it might be a good idea to cut it up in half. This way it is easier for them to smell and taste the juice. Feeding too many grapes at a time could cause digestive problems with your rabbit. And in the long run, all that sugar will probably cause other problems like obesity. In other words, make sure to offer grapes in small amounts. As a simple rule of thumb feed one grape per rabbit per day. Grapes are also easy to hand-feed your bunny and allow you to develop a close bond with your pet. Conclusion: sure, rabbits can eat grapes as an occasional treat. What’s your favorite way of feeding grapes to your rabbit? We’d love to hear from you.